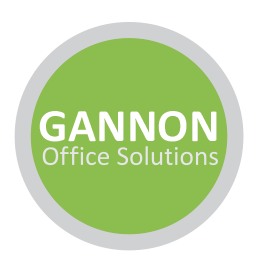 Welcome to the Gannon Office Suppiles internet web site (“www.gannonofficesolutions.ie”). Please read carefully our Terms of Business and Use of Site which governs your use and purchase of products from our Web Site. By using, accessing, browsing, or placing an order on this Site, you acknowledge that you have read, understood, and agree to be bound by these terms. If you do not agree with these terms then please do not use this Site. Any other use of the Contents on this Site including reproduction for purposes other than as noted above, including any reproduction, modification, distribution, or republication may violate copyright or trademark laws, use, without the prior written permission of Gannon Office Supplies, is strictly prohibited. This Site is owned and operated by Gannon Office Supplies Ltd. The information contained on this Web Site, including all images, designs, text, graphics, and other materials that appear herein are copyrights, trademarks or other intellectual property owned, or licensed (all of which, collectively, are referred to as the “Contents”) by Gannon Office Supplies. All contents and arrangement of content including all other information on this Site are copyright of Gannon Office Supplies. Permission is granted to display, copy, print and distribute in hard copy sections of this Site for the purpose of browsing and shopping or for placing an order at gannonofficesupplies.ie. Unauthorised use of the material on this site without written prior permission of Gannon Office Supplies may violate copyright, trademark and other applicable laws. No contract will be final between the customer and B.O.S.S. LTD. T/A Gannon Office Supplies for the sale by it to you of any product unless and until Gannon Office Supplies accepts your order by sending you a VAT invoice. Gannon Office Supplies specializes in selling to business consumers and reserves the right to refuse orders it deems to be of large quantity or placed by resellers. Your order confirmation is for your convenience only and does not constitute an acceptance of your order. That acceptance will be deemed complete and will be deemed for all purposes to have been effectively communicated to you at gannonofficesuppliesie. Title in the goods shall not pass to the customer until all sums due from the customer to the supplier (Gannon Office Supplies) on any account have been paid in full. “List Price” – any “list price” used on this Site represents the manufacturers’ suggested retail selling prices and may not be indicative of the prevailing selling prices at any specific time and place in your area. “Our Price” – despite our careful attention to pricing, an item could be inadvertently miss-priced. If an item’s correct price is lower than our quoted price, we will charge the lower amount and deliver the item to you. If an item’s correct price is higher than our quoted price, Gannon Office Supplies will have the right to refuse or cancel any such orders whether or not the order has been confirmed and your credit card charged. Gannon Office Supplies offer special prices for larger quantities, for this special price you should contact Gannon Office Supplies directly at 01 5057400 or email sales@gannonofficesuppliesie. V.a.t. is not included in any price displayed or quoted by B.O.S.S. Ltd., T/A Gannon Office Supplies. All furniture orders are delivered flat packed, assembly can incur a cost unless otherwise agreed in writing. All references to your “savings” on this Site are based on your average savings relative to the “list price” excluding the VAT calculation. • Special items including safes and certain furniture items – up to 15 working days as indicated in product information. • Printing delivery times will be quoted at order stage. Orders must be placed before 4.30 pm. If your order is received after 4.30pm, we will deliver the order within normal working hours within 2 business days for stationery and 6 business days for furniture and bulky items. If for any reason we cannot deliver your order within this time period we will contact you immediately to arrange a new delivery time with you. We reserve the right to substitute goods within your order with goods of an equivalent nature (e.g. a blue stapler for a red one). If you do not wish to accept the substituted goods then you must return them to us within 3 working days of receipt. Special orders i.e. orders made to your specifications cannot under any circumstances be returned or cancelled, once an official order has been received from you by Gannon Office Supplies. We may contact you periodically to communicate promotions and special offers. As per the legal requirements, on every communication a valid ‘opt-out’ option will be provided, by returning this email you will be excluded in all further communications of special offers. B.O.S.S. LTD., T/A Gannon Office Supplies is providing, ( to the fullest extent at law ) this Site and its Contents on an “as seen” basis and makes no representations ( Absolutely None ) or warranties of any kind, either express or implied, including, without limitation, warranties or conditions of title or implied warranties of merchantability or fitness for a particular purpose. Gannon Office Supplies believes the Content to be accurate, complete, and current, Gannon Office Supplies does not represent or warrant that the information accessible on this Internet Web Site is accurate, complete, or current. Price, availability and other information is subject to change without notice. In no event will B.O.S.S. Ltd be liable for special, indirect, or consequential damages or any damages whatsoever, including but not limited to, loss of use, data, or profits, without regard to the form of any action, including but not limited to contract, negligence, or other tortuous actions, all arising out of or in connection with the use, copying, or display of the Contents of this Internet Web Site B.O.S.S. Ltd T/A Gannon Office Supplies will, from time to time, make changes in the Contents and in the products or services described on this Site in order to improve its function.